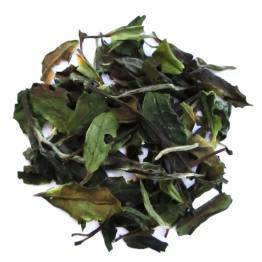 White tea is the un-oxidized Camellia Sinensis leaf freshly plucked and dried. White teas usually do not undergo any processing whatsoever, and apart from being dried, are the closest one usually gets to steeping the leaves right off the tea plant. Until recently, white teas were reserved for the social elite. In the past they were only consumed by the royal families of China, as white tea is only harvested for 2 to 3 weeks during the year and the supply was always limited. Today, Chinese white tea is exported throughout the world, and is available in several grades. In our Special Reserve section, we have a small quantity of Grade 1 Silver Needle available. Mmmm blueberries! Healthy and refreshing, fruity, sweet.. what's not to love? Light, floral, fruity and slightly grassy, a well balanced white tea.